I’d heard about a way to upload multiple contributions via the API and landed on another page on Francois-Xavier’s site which gave me most of the info I needed to get going, however I was still having some issues as I’m not a PowerShell person. Or a developer. This post is not going to cover ALL of the core things about the API since the blogs referenced above do a great job of telling you how to get started. What I will cover is where I got stuck and how I got it working to successfully upload my contributions en masse from a CSV file. 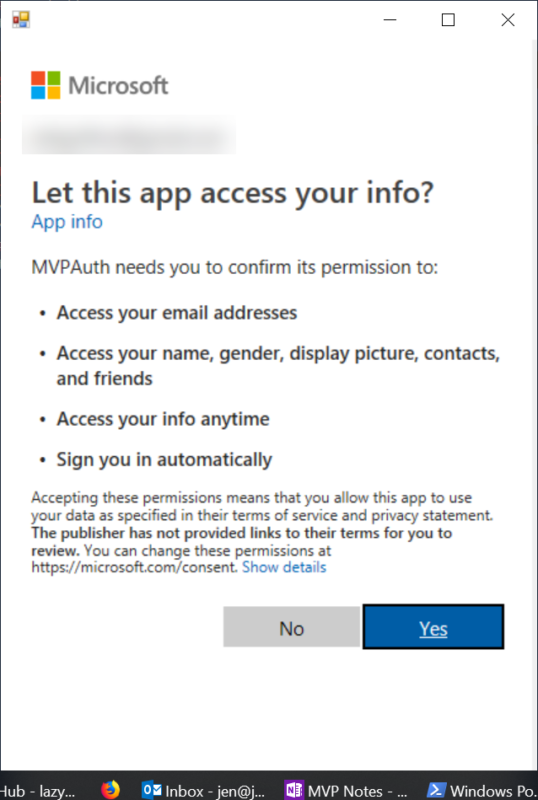 Get a developer key with your MVP site login, here. Specifically, what you need is the Primary key (there are 2, you don’t need the Secondary key for this). Follow through the steps from Francois-Xavier’s blog about installing the MVP module in PowerShell etc. The github page he created for this has a lot of useful info on this. Below this is an Excel template I created to make this easier for me to do quickly. The format is clearly laid out on the pages linked above but this is where you can easily spin your wheels if you get something slightly wrong in syntax or formatting. The Excel template has a ReadMe page with the key info you need, like date format. I didn’t get too fancy with the template, but I did take the time to download all of the contribution types and contribution areas so it is up to date as of this year’s (2019) award category structure. I’ll attempt to update this as things change but keep in mind you may need to do that on your own if this gets out of date! They key thing is the wording needs to be exactly what’s in the drop down lists on the MVP site where we enter community activities. Long story short: The Full Contributions tab is to list everything including multiple award categories. However, the upload doesn’t accept multiple award categories yet so there is another tab “For CSV” which is simply formulas pulling the columns up to ContributionTechnology but ignoring the multiple award categories columns from the “Full” tab. Some day the PowerShell bits may get updated but today it is single contribution area only. Personally, I used the Full Contributions tab to filter on the contributions I had in multiple areas and manually updated them after uploading. Not ideal but …. So, once you have your contributions in the spreadsheet, do a “save as” on the “for CSV” tab to save that tab to a CSV file somewhere on your computer which you will navigate to from PowerShell next. Bear with me if I am not using the 100% proper terminology on this part. As I said above, I’m neither a developer nor a PowerShell guru so this was all new to me. If I’m giving bad advice, please reach out so I can update the post accordingly. I’m attempting to err on the side of caution, at least based on what I know and learned in this process. Let’s get started. First off, you need to run PowerShell as admin. I don’t know if there is an option not to have to do that, so I ran it as admin. … and it will open the profile in Notepad and/or prompt you to create one and save it. While testing this step again for this post, on a different computer, I got a “path doesn’t exist” message and didn’t know where to save my profile or what to call it. If you get that message, then simply type in $profile in PowerShell, it will display what and were your file should be, in order to create the file in that folder with that filename. I didn’t have a profile so these 3 lines below that I pasted in were the only thing in my profile after this step. The # is a comment, put whatever you want there. Put your primary key in the YOURKEY section in single quotes. The $MVPSubscriptionKey is simply a variable name so make up whatever you want. This is setting a variable then using it to set the key for the MVP module. Putting this in your profile means it does this automatically and you never have to think about your key again. Once your profile is saved, you’re done, except that you may need to set the proper execution policy on your machine to allow the profile to be read and loaded upon running PowerShell. This is what I got, initially, until I set the proper execution policy. “…. profile.ps1 cannot be loaded because running scripts is disabled on this system.”. If you open PowerShell without doing that, and don’t have that or higher as the default execution policy, you will see a red error in PS about your profile not being able to be executed. After doing this, if the execution policy is correctly set, you will now be prompted to log in with your MVP credentials. This will occur each time you launch PowerShell so if you do other work in PS, you may want to comment out the profile bits for every day purposes to avoid having to go through this each time. More info about this can be found here on the docs.microsoft.com site. What I like about this is once I close PowerShell, execution policy reverts back to the default which in my case is RemoteSigned. What I actually did with that line above is put it in my profile with a # sign (as a comment) so I could easily copy and paste the command into PS each time I need it, instead of looking it up each time. This should return your profile information to you in the console window. If you haven’t added the subscription key to your profile, then you would need to run this first, before running any Get commands. Finally, the good part! The syntax I’m using here is assuming I have navigated in PowerShell to the directory where my CSV file is located, hence I’m simply referencing a filename, not a path and filename. YMMV here. “YourFileName.csv” is whatever you’ve called your file. At this point, it should just work, if you’re properly authenticated. If you’re risk-averse, simply put 1 or 2 things in your first CSV file so that it’s easy to delete the info if it’s wrong! I hope this helps you get your contributions uploaded in bulk, I know there were a few details left out of the original developer blogs that weren’t obvious to me and I figured I’m not the only one who may run into the same hiccups!